Heat oven to 350°F. Cut bread into bite-sized pieces. Place bread pieces in ungreased 15x10x1-inch baking pan. Bake for 10 minutes or until lightly toasted, stirring twice. Transfer to serving bowl or basket. Meanwhile, place cheese in large saucepan. Cook over low heat until cheese is melted, stirring occasionally. Stir in broccoli, beer, pimientos and dry mustard. Cook until hot, stirring occasionally. Pour cheese mixture into ceramic fondue pot over low heat. 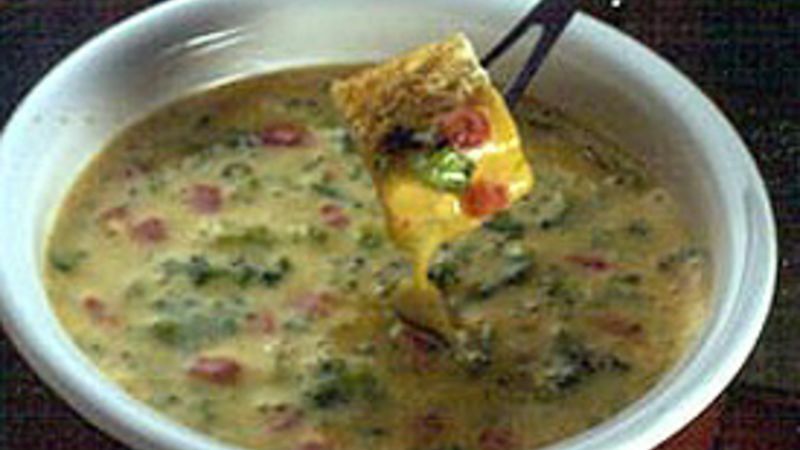 Using fondue forks or wooden skewers, dip toasted bread pieces into warm cheese mixture.